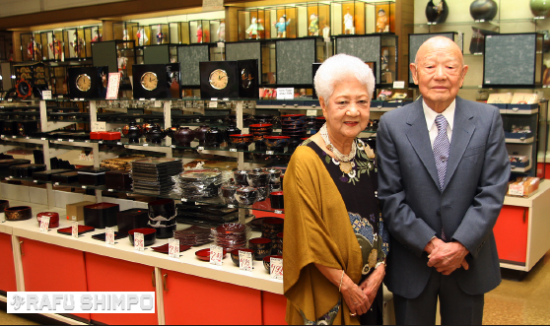 Owned Little Tokyo import store for 56 years. Kiyoshi “Skip” Kawaratani, owner of Rafu Bussan, Inc., a Japanese import store in Little Tokyo, for 56 years, passed away on Oct. 23 at St. Vincent Medical Center in Los Angeles. He was 88. He is survived by his wife of 61 years, Aiko Kawaratani. They did not have any children. His five remaining siblings are Yoshiko Tanaka, Tom Kawaratani, Fumiko Ozaki, Yukio Kawaratani, and Toshiko Masumoto. Funeral services will be held at 3 p.m. on Sunday, Nov. 2, at Zenshuji Soto Mission Temple in Little Tokyo, located at 123 S. Hewitt St., Los Angeles. There will be a viewing before the services, starting at 2 p.m. Rev. Shumyo Kojima of Zenshuji Soto Mission will be the officiant for the services. Irene Tsukada Simonian of Bunkado, a Little Tokyo gift shop that opened in 1945, said, “Rafu Bussan and Bunkado’s relationship is special and unique. Normally, two stores like ours would be competing with each other, but not a week goes by where a customer would say ‘Rafu Bussan sent me here’ after we suggest they go there to find their elusive product. We consider them friends rather than rivals, and Skip’s generosity and kindness is why our friendship has lasted through generations. 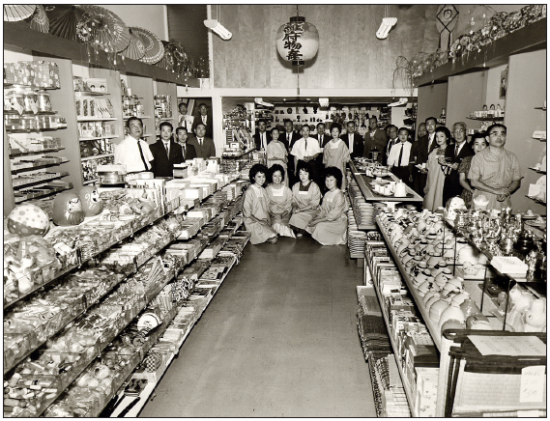 “Not only are our stores a block apart, my parents and the Kawaratanis’ homes were almost the same distance from each other, and in the old days we alternated days hosting parties for Japanese wholesalers during the L.A. Gift Shows. This further bonded our businesses and we continue to this day to support each other. Shawn Miyake, president and CEO of Keiro, commented, “Keiro is saddened by news of the passing of Kiyoshi ‘Skip’ Kawaratani. Incredibly supportive of the Japanese American community, Skip and Aiko Kawaratani expressed their kindness and generosity to Keiro’s residents throughout the decades. In more recent years, Keiro Retirement Home residents enjoyed viewing the Nisei Week Grand Parade from spaces set aside for them on Second Street in front of Rafu Bussan. Kawaratani was born in 1926 on the family farm in the outskirts of the small town of San Juan Capistrano. He was the fifth son and sixth child of Otokichi and Hisa Kawaratani from Wakayama-ken. There were eventually ten children, so he grew up on the farm with many siblings. But times were hard because of the Great Depression, which lasted from 1929 to 1939. Just when the family farm was prospering for a few years in the little hamlet of Trabuco Canyon in Orange County, Japan bombed Pearl Harbor. The family was forced to sell the farm, home, equipment and belongings for a fraction of their value, as they could only take what they could carry. During World War II, the family was incarcerated first in Poston, Ariz., where Kawaratani graduated from high school. Then the family was sent to the Tule Lake concentration camp in Northern California. Ironically, three older brothers were drafted and served in the U.S. Army, and one fought in Italy with the 442nd Regimental Combat Team. In 1946, Kawaratani, his father and his eldest brother went to Japan. The other eight members of the family remained in America and settled in Long Beach. Tragically, his father died after only five years in Japan, presumably of a broken heart. During his 10 years in Japan, Kawaratani worked for an American trading company. In 1951, he met Aiko Tamamitsu of Osaka, and in 1953, they were married in Yokohama. The couple left Japan in 1956 and settled in Los Angeles, where they began working for the Rafu Bussan Japanese imports store at 344 E. First St. in Little Tokyo. Store founders Yukio Tanaka and Junichi Onishi started as traveling merchandisers, taking orders from farming families returning from the camps for staples such as rice, tea, Japanese canned goods and rice bowls. Onishi retired in 1958 and sold Kawaratani his share of the partnership in Rafu Bussan. Eight years later, Kawaratani bought out Tanaka, and the couple became sole owners of the business. In 1979, the Community Redevelopment Agency purchased and demolished their First Street store building to construct Japanese Village Plaza. Anticipating the move, in 1977, Kawaratani entered into a long-term lease for the vacant Sho Tokyo Japanese Movie Theater building on the south side of Second Street. Until the remodeling was done in July 1978, Rafu Bussan ran the two locations. Because of the theater’s sloping floor, a significant investment had to be made to reconstruct the floor and add large glass show windows and doors. The old theater was transformed to showcase the Japanese imports. The tall, fan-shaped pole sign remains from the old theater and is a familiar landmark in Little Tokyo. 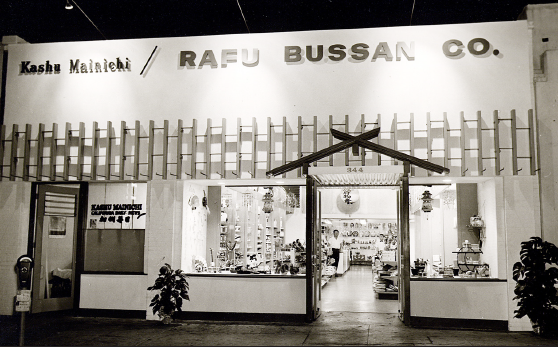 Over the years, Rafu Bussan has become the largest Japanese import retail store in Little Tokyo with a loyal following of customers from throughout the United States and internationally. The Kawaratanis have carried a wide range of imported goods, including chinaware, lacquer ware, porcelain containers, Japanese dolls and many other gift items, and have always emphasized quality in their merchandise. Rafu Bussan will continue business as usual with owner Aiko Kawaratani, who will be assisted by long-time employees Carol Tanita and Rigo Martinez. Tanita and Martinez have worked for the store for 41 and 25 years, respectively. They have been like daughter and son to the couple.